The global lipid disorders market is estimated to grow at a significant rate, states Transparency Market Research, in its recent report. The analysis on lipid disorders projects the market of lipid disorder treatment is likely to reach around worth of US$40 bn by the end of year 2026. Development of the global market is pushed by advancement in the treatment for lipid digestion disorders. Organizations associated with lipid disorder treatments are vigorously putting resources into resource and development work of novel medications to bring down cholesterol levels, which helps in diminishing rate of lipid disorders. Organizations operating in the global market incorporate Novartis AG, Pfizer, Inc., Astrazeneca Plc, Emcure Pharmaceuticals Ltd., Merck and Co., and Ranbaxy Laboratories Ltd. The global market for lipid disorder treatment is expected to grow at a steady CAGR of 7.4% within the forecast period from 2017 to 2026. Various biopharma organizations are concentrating on developing a creative solution in order to treat lipid disorders. Regionally, North America is likely to lead the market rising cases of several medications for lipid disorder treatment. The mentioned region have high market engaging properties which can be credited to increased rates of various lipid disorders and related cardio vascular ailments. Market for lipid disorder treatment is to a great extent impacted by developing occurrences of disorders related with LDL and rise in triglyceride level in human body. Lipid disorders are to a great extent seen among working people over the globe, which is caused because of less body developments, failed weight control plans, immobile activity and poor lifestyle and habits, for example, excessive smoking and drinking that bring about rise in cholesterol level. This has set off the utilization of different medications, for example, lescol or fluvastatin, atorvastatin, simvastatin, and rosuvastatin to cure lipid disorders as they control and diminish the level of triglycerides and harmful cholesterol in the blood. 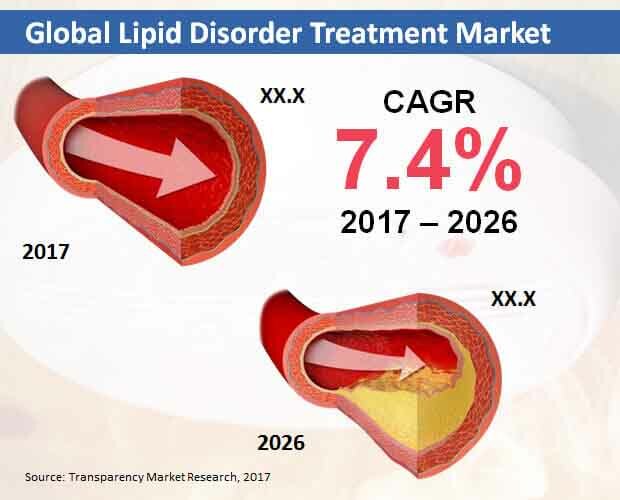 The global market for lipid disorder treatment is experiencing a growth, offering the producers potential scope in future for distribution and advancement of these medications in the coming years. As there seems to be a rise in the cases of lipid disorders in people, pharmaceutical organizations have started upgrading their drugs, and launch of new medications and initiating phase trials of these medications on an expansive scale. Statins are thought to be immensely powerful in bringing down the rate of cardiovascular episodes. Most organizations are concentrating on large scale manufacturing of atorvastatin as they are an exceedingly powerful less density lipoprotein lowering compounds, LDL being the primary driver of lipid disorders and related heart ailments. The utilization of atorvastatin is estimated to develop at a higher rate. Market for lipid disorder treatment is to a great extent impacted by developing occurrences of disorders related with LDL and rise in triglyceride level in human body. Lipid disorders are to a great extent seen among working people over the globe, which is caused because of less body developments, and poor lifestyle and habits, for example, excessive smoking and drinking that bring about rise in cholesterol level. This has set off the utilization of different medications.